AudioWatermarking.info announces availability of a new product in the Audio Watermarking Tools family: AWT0 (“AWT-Zero”). AWZ-Zero allows for high capacity, completely inaudible watermarking and signaling over lossless audio PCM channels. It is an ideal, and generally the only solution allowing to protect your extremely short audios such as impulse responses (IR) and short audio samples. AWT0 successfully watermarks wave recordings even below 100ms in length. Major update of AWT2 technology – version 0.12.00 is now available. (Encoder) new ‘-quality’ switch and SDK parameter. The parameter is related to an optional mechanism responsible for preservation of the original signal quality. The quality setting can be from 0 to 10. Zero setting switches the mechanism off. Non-zero settings force the encoder to perform additional signal analysis aimed to further improve original audio signal quality in its parts which are “sensitive to manipulations”. Refer to the full changes log. 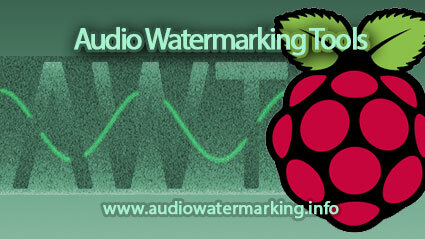 Audio Watermarking Tools (AWT) of www.audiowatermarking.info are now available on the Raspberry platform. Customers can run AWT on this compact and cost-effective ARM-based platform to perform live audio streams watermarking and monitoring. Details and information are available at www.audiowatermarking.info. now the CLI encoder tool uses only a fraction of RAM it required earlier. The encoding is now done buffer-by-buffer, and the tool does not load the entire audio file into memory. added support for a “compound payload”, i.e. a sequence of different payloads that are to be embedded at different time-locations within the audio stream. Each payload must be accompanied with the time where the payload should start. Such sequence must be of the following form: time_sec:hex_payload;time_sec:hex_payload;… No spaces are allowed in the compound payload, the semicolon “;” is used as a delimiter. The ‘time_sec’ can be a positive offset (in seconds) relative to the start of the file, or a negative offset relative to the end of file. You can use ‘void’ payload to designate bypass (no watermarking). AWT3, over-the-air signalling and triggering technology, has been updated. The new release features improved, more light-weight decoder function with signal time/speed-variation support. For more details, please contact AWT3 developer. I’m glad to announce that TrustedAudio.com opens its doors for beta-testing. TrustedAudio (TA) is a professional web-based tool that provides an easy and reliable way to share, deliver, and distribute audio files securely by means of watermarking and digital signing. At this stage, public registration is closed, but you can ask for invite by leaving your request via the Contacts form on the TA website or just sending mail with request to mailbox /at/ trustedaudio /dot/ com.